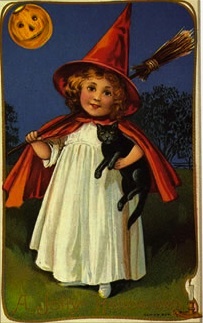 It was already too late by the time Hilda realized that the cat had knocked a stack of Shirley Temple movies into her pot of witch’s brew. The vision I am having right now with ShirleyTemple movies dancing in my head is priceless. Great idea Quilly. LOL funny!. Oh, imagine what the sweetness of Shirley Temple movies could do to that witch’s brew. She be drummed out of all the best witch circles. I laughed a lot at this. Hilda does like she’s emulating Shirley temple’s curls. I can tell she’s a big fan of Shirl. Now this was very original and quite clever! Looking at that picture again… yup… She does look like Shirley Temple alright. Terrific idea! I reckon she could now be mascot for the Knights Templar. Curses! and I bet she hasn’t got an antidote! I definitely saw Shirley in this photo but I couldn’t figure out a way to pull her out! I yield to you, oh Q! Time to switch to a dog, I’m thinking! You never know about those cats! LOL! What a great take on the pic of the day, Quilly, as always! Hope you have a lovely week! Quilly, I hope you had your cat locked up last night! This is wonderful, Quilly! It reminds me of my old Shirley Temple days. I just KNEW there was an explaination for that hair! So, this is what happened to Samantha. Ah, such a fine dress of Carrickmacross lace! Just what that cat would do! My commiserations to Hilda. Thanks for stopping by mine and finishing up the “evil pumpkin” tale. You have a warped mind. I love it. I didn’t see the Shirley Temple idea until I read your MM and looked at the picture again! I was too focused on her CLOTHES! LOL! Good and clever of you to see that! So good! Very clever. She does remind me of Shirley Temple. Very clever take, Quilly. I didn’t see the resemblance until reading your MF, but you’re spot on. Great story.